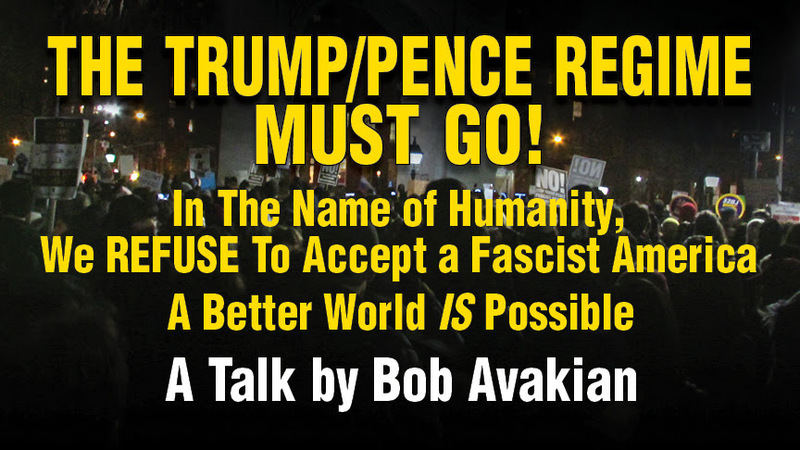 Bob Avakian, The Trump/Pence Regime Must Go! Also, Trump Ends Temporary Protected Status (TPS) for Immigrants. We'll hear the first half of the talk "THE TRUMP/PENCE REGIME MUST GO! In the Name of Humanity, We REFUSE To Accept a Fascist America, A Better World IS Possible," by Bob Avakian, Chairman of the Revolutionary Communist Party last fall. Bob Avakian (BA) dissects that the election of Donald Trump signals that we are being confronted and now ruled by a fascist regime. It examines why people voted for Trump and how things came to the point where we are confronting the real horror of a fascist America. Told briefly is the “longer story,” the broader history that has led to this. You can watch a video of the entire talk here. We'll also talk with Julie Mitchell, Managing Attorney at CARECEN, and Evelyn Hernandez, a TPS holder and organizer. about the Trump regime's latest decision to end Temporary Protected Status, TPS, for Salvadoran immigrants. He had previously ended TPS for immigrants from Haiti, Honduras and Sudan. About 250,000 Salvadoran immigrants have received TPS, which allows them to live and work in the US. This status was created in 2001, under the Bush administration. All may face deportation after decades in the US. CARECEN defends human and civil rights for Central Americans and all immigrants, works for social and economic justice and promotes cultural diversity.